It's here, internet: the game you’ve been waiting for. It’s filled with snarky, self-deprecating dialogue, 80s nostalgia, madcap memes, wig-wearing sloths, Reddit references, and truckloads of geek jokes abound in this weirdly beautiful and disturbing distillation of all things internet. Even mouth-breathing, fedora-festooned neckbeards have a place in the world of Paradigm. 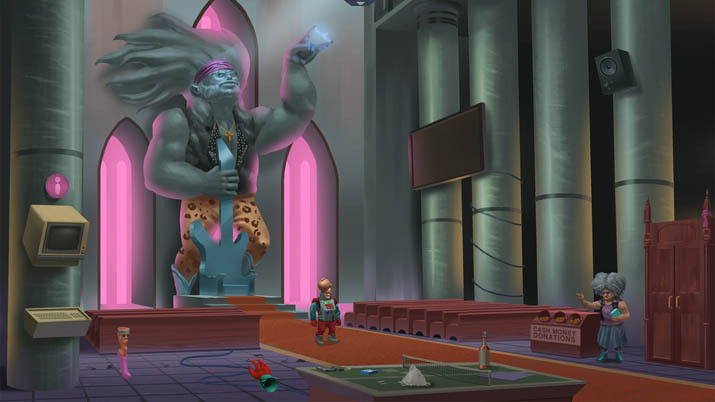 Paradigm is a surreal point-and-click adventure game that follows the journey of a lascivious, but generally well-meaning mutant named Paradigm. It’s unclear if the Eastern-European protagonist exists in an alternate universe, but as the game’s timeline reveals itself to be in the not-so-distant future, you find yourself searching for whatever catastrophic event lead us to a dystopian world where anthropomorphic eggplants sell beatbox riffs to make rent. The controls are standard for point-and-clicks and you have the option to look at, talk to, use, and pick up objects. What is not standard is the title’s commitment to making every interaction unique. Most point-and-clickers repeat the same phrase — or do nothing — when you try to do something silly, like talk to an inanimate object or pick up the sky. Paradigm is different; if you try to chat something up, at the very least, he (Paradigm) says hello. Attempting to pick up objects is an absolute necessity to experience the full brilliance of the adventure. If Paradigm doesn’t need an object, he interprets “pick up” as a command to make a cheesy come-on. Paradigm's endearing efforts to woo almost every object in existence is legendary and hilarious. There are a few things Paradigm won’t hit on, however, and they’re so horrifying we probably shouldn’t mention them here. It’s better if you discover them on your own, anyway. The game has two modes: one for strong, independent adventure players who don’t need hints, and a kinder, fuzzier option for players who are either new to the genre or can’t be bothered to risk viruses from sites promising walkthroughs. Those that select hints can also choose between vague nudges or outright directions on what to do. Purists may hate this option, but for accessibility purposes, it makes the game friendly to players of any skill level. As an added perk, the initial tutorial is replayable. While it is nice to have these features, even young or inexperienced players will not find a lot of challenge in Paradigm. The puzzles are straightforward, and border on easy. They also lack one of the basic elements of most point-and-clicks: The please-let-this-work item smash. 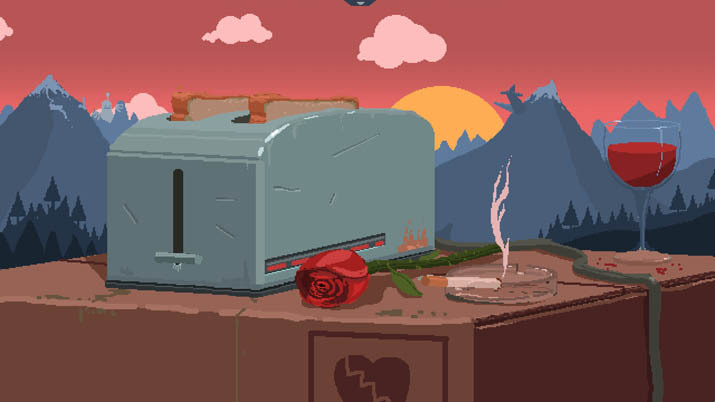 While Paradigm does have a few item combinations in play, there isn’t a lot of it, and the necessary combinations are obvious, like combining peanut butter and a bread to make a sandwich (not a spoiler). 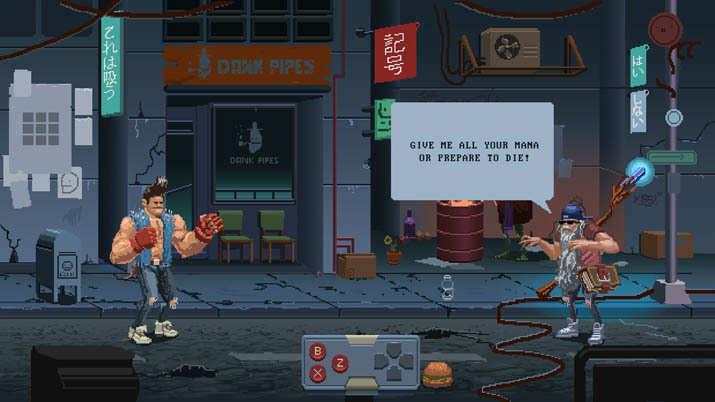 One of the most frustrating, beloved, and endearing elements of point-and-click adventures is the moment when you’ve tried everything reasonable and start connecting every object in your inventory in the hopes of making a match. That blissful moment when something goes together in the absence of all logic is what makes the genre so lovably hateful. Without that, one wonders why a hint system exists at all. However, Paradigm’s brilliance isn’t in the gameplay. It’s the jokes, graphics, music, and voice acting. Its uncoordinated absurdity reaches Dali levels, but with a sublime humor that underscores it all. The artwork is a mishmash of different designs, from stylized 2D art to 8-bit graphics, with a dash of claymation thrown in for kicks. It works together to build a world that is both strange and nostalgically familiar. When many studio-created, publisher-backed games have voice acting so bad it forces you to turn off sound to keep your ears from bleeding, it is impressive beyond measure to find this level of quality in an indie game. Accents from all over the globe bring life to the game’s wildly diverse cast, making each one as memorable as the last. Even in greatness, there are flaws. Most of the bugs in Paradigm are minor. For example, the hotspot highlighting feature doesn’t recognize when an object has moved. If an interactive object no longer exists, it still lights up in its original position. Also, In a few places, the hotspot icon won’t turn off, leaving a distracting, glowing floppy disk on the screen. The most disruptive bug was an unpredictable show stopper: after some scripted events, it became impossible to interact with objects. Sometimes, leaving the area and coming back was enough to fix the issues. Other times, it required shutting the game down and reloading. It’s annoying, but none of these bugs made the game unplayable.